During summer 2015, the British Council and the Royal Opera House joined hands and extended a sunny welcome to 18 international opera directors, producers and festival programmers from as far afield as the USA and Canada and as close to home as Belgium, The Netherlands, Denmark, Germany, Ireland, Norway, Sweden, Austria and Portugal. A similar number of their peers from the UK were invited to join what became an inspiring, thought-provoking and enjoyable two-day event to explore contemporary opera and music theatre, discussing and demonstrating inspiring developments and trends in the sector. The UK is a rich and fertile ground for new opera; it enjoys a wealth of composers, companies, ensembles, festivals and independent artists actively choosing to work in contemporary opera. This project brought together influential international figures to share practice, challenges and explore ways in which, working together, they might support new opera and music theatre across a growing international collaborative network. 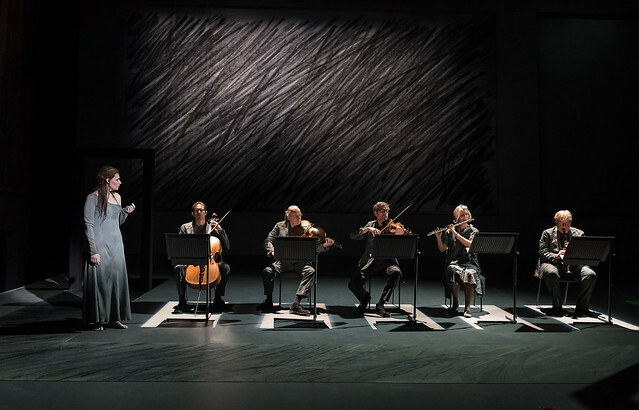 The London premiere of Harrison Birtwistle’s new chamber opera, The Cure, opened the event and provided a focus for the symposium at the Royal Opera House’s Linbury Studio. Harry gave an insightful interview with Tom Service at the Linbury in which he remarked on his pleasure to be given time to develop the work and also offered his perspective on composing for theatre and smaller ensembles under the title “A route to the main stage or a destination in its own right?” We include extracts from the interview below. “On the big stage there’s no such thing as close up. You can’t deal with it like cinema for instance ... but with this piece it’s the difference between ... a string quartet playing a piece of music to a full orchestra. When I have pieces done with an orchestra, very rarely do [the musicians] come up to me [to talk during their breaks] ... they get up for their coffee [and] there’s a sort of barrier … but with [a small ensemble] there’s a question of detail … in every aspect of the piece it’s completely different ... it’s a different way of thinking ... that doesn’t mean that it can’t be ambitious [but] it’s a different ambition. The Cure, as performed at The Royal Opera House. Photography by Clive Barda. For more images, visit the The Royal Opera House Flickr site. “I come back to Peter Hall, he said: 'in theatre everything’s possible.' You can tell the story of the world with one person, maybe two. “[For example, in the opera Gawain] how was it possible to put a [pantomime] horse on stage that was noble? And how could you cut somebody’s head off and it sings?